A light and healthy dessert that takes just minutes to prepare. Makes 12 servings. ½ cup per serving. 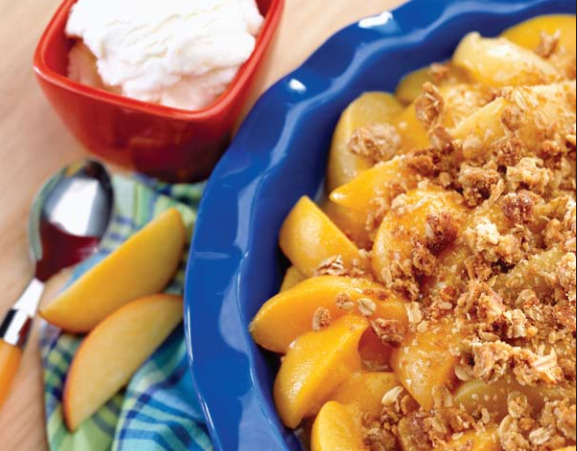 Spray a 9-inch deep dish pie pan with nonstick cooking spray and pour peaches in the pan. In a small bowl, stir in cornstarch, vanilla, and 1 teaspoon cinnamon; pour the mixture over peaches. In a large bowl, mix the remaining cinnamon, oats, brown sugar, flour, and butter with a fork until crumbly; sprinkle over peaches. Bake for 20 to 25 minutes or until juices are thickened and bubbly, and topping is lightly browned. Serve while hot.